Registration open through Breitenbush Hot Springs. Recent snowfall has disabled phone lines and the online registration system at Breitenbush. If you are unable to reach a staff member via telephone, please email their office to request assistance with your enrollment, office@breitenbush.com. What is sustainable in your life? What kind of lifestyle and practice routines would be helpful for you to practice to sustain you from this season into the next, this life phase into the next? 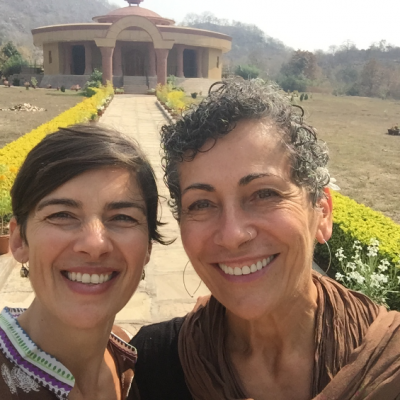 Join Chiara Guerrieri and Anne Phyfe Palmer for a spring retreat at Breitenbush, a retreat center Chiara and Anne Phyfe have visited since the 90s. Our focus in this retreat is to cultivate both autonomy and connection, in community. We will practice daily, and spend time as a group learning to exist and communicate with harmony and compassion. Our classes and the experience of living at Breitenbush will encourage healthy sleep, food, and yoga routines. The physical practice will be appropriate for all levels and most bodies (please email us if you have any questions). Meditation will be offered in formats that encourage accessibility and sustainability. We will attend to what is real and relevant, and let go of what it is time to release. This retreat begins with Dinner on Friday, April 5, starting at 6pm. Check-in is at 4pm, you may arrive at 3pm. The last meal served is lunch, at 1pm on Tuesday, April 9; you may stay on the Breitenbush property until 3pm. About Breitenbush: Breitenbush is a remote forest retreat of timeless natural beauty – old growth forest, abundant hot springs, glacier-fed river, and surrounding mountains – a place to discover a vast and personal connection with the natural world in any season. Without the responsibilities and distractions of our daily life we are able to drop deeper into our natural ability to be present. On retreat, you will have access to unparalleled relaxation, delightful company, healthy vegetarian food, walks in the forest, thermal baths, sauna, silence, and the nurturing qualities of Breitenbush. It is an ideal environment to enhance your growth as a wholesome yogi/yogini. Learn more about Breitenbush at breitenbush.com. Cost: The following prices include lodging, all yoga instruction, meals, and use of facilities at Breitenbush. Cabins are geothermally heated, rustic, but very cozy. Options for Double or Triple Occupancy only, and depending on availability, no requests other than roommate preference. The total cost is $766-$1,006, split into a lodging payment and a tuition payment. Payment for lodging is required to reserve your spot (approximately $316-506) and will depend on your choice of cabin with or without plumbing. Remaining balance (tuition) is due upon arrival ($500). Registration: Please register for this retreat through Breitenbush Hot Springs. Their registration lines are 503.854.3320, 503.854.3321 or 503.854.3314. If you are registering with a roommate, please be prepared to pay deposits on the same day. Breitenbush Deposit/Cancellation Policy: The deposit for those attending a workshop is the full lodging amount. Deposits are non-refundable. With cancellation notice of at least seven days Breitenbush will issue a credit voucher (good for one year) for the amount of your deposit less a $20 processing fee. If you cancel less than seven days in advance, your deposit will be forfeited. Your balance is due upon arrival. Breitenbush accepts MasterCard, Visa, Discover, cash and personal check with ID. Transportation: Breitenbush is a 5-hour drive from Seattle, one hour east of Salem, OR. Downloadable directions to Breitenbush. Participants are welcome to stay on the property until 3pm.